The 2019 Chevrolet Corvette ZR1 at the Los Angeles Auto Show in November 2017. 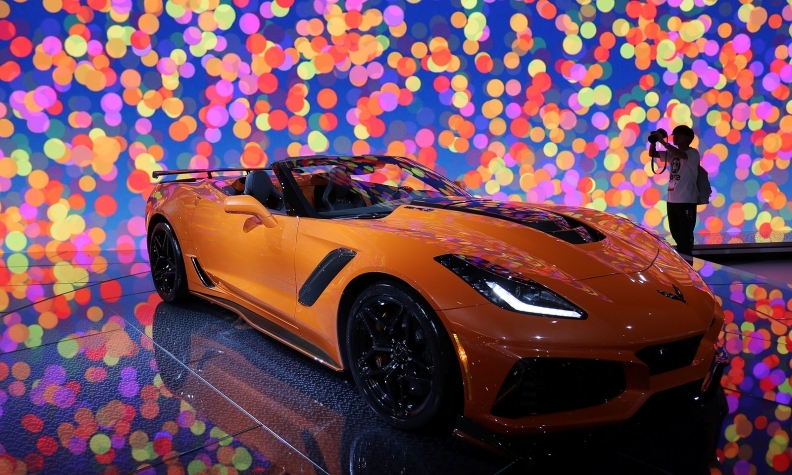 DETROIT -- General Motors is recalling nearly 545 Chevrolet Corvette ZR1s from the 2019 model year in Canada and the United States because of airbag deployment issues, the automaker says. Of the 543 affected vehicles, just 45 of them are in Canada. A recall document in the United States says that if the sensing diagnostic model "is exposed to extremely hard braking and sustained acceleration events under certain track conditions, the SDM may enter a fault state and will not return to normal operation until battery power is removed from the system. In this faulted state, the SDM will not provide crash sensing or deploy airbags in the event of a crash." The faulty operation could result in increased risk of injury in a crash. GM estimates one percent of the vehicles recalled could have the defect. A GM Canada spokeswoman confirmed the same problem exists in 45 vehicles in Canada. “The notice of defect regarding a sensing diagnostic module (SDM) on certain 2019 model-year Chevrolet Corvette ZR1 vehicles was communicated to Transport Canada on May 31 and affects 45 VINs in Canada,” Jennifer Wright said in an email to Automotive News Canada. “Notification will be mailed to impacted Canadian customers on June 29. Customers can look up their vehicle identification number at https://recalls.gm.ca to see if their vehicle is affected by the recall. The issue with the 750-hp vehicle was discovered by GM engineers during a media demonstration at the Road Atlanta racetrack at the end of April, Jalopnik reported. The recall document sent to Automotive News by a GM representative states that engineers reported the issue May 3 and an investigation was opened May 8. GM tested the vehicle at its Milford Proving Ground, and a field data search, completed May 17, revealed no related field events. The automaker's Safety Field Action Decision Authority decided May 24 to conduct a recall. A GM spokesperson said U.S. customers can check their vehicle identification number against the NHTSA or Chevrolet recall websites to see whether their vehicle is involved. U.S. dealers were notified of the recall May 31 and can reprogram the device immediately. GM expects U.S. owners will also be notified starting June 29.